Fans of the Looney Tune may recall Bugs Bunny’s trick of tying a bonnet round his head, jumping in a basket, and pretending to be a foundling. It was a sure fire way to stir sympathy and find a protector. It worked for Bugs every time. The peeled bullet-shapes sold in plastic bags and labelled “Baby Carrots” are masquerading in much the same way Bugs did. Everybody loves a baby. A farmer out in California understood that when, back in the 1980’s, he was looking for a way to market misshapen carrots that couldn’t be sold in whole form. The virtual World Carrot Museum describes Mike Yurosek as a “think outside the carrot patch guy”. Mr. Yurosek put his lumpy rejects through a potato peeling machine and sold the result as “Bunny Luv”. Today Mr. Yurosek is remembered as the “Father of Baby Carrots”. Since the success of “Bunny Luv”, faux baby carrots have multiplied…like rabbits. 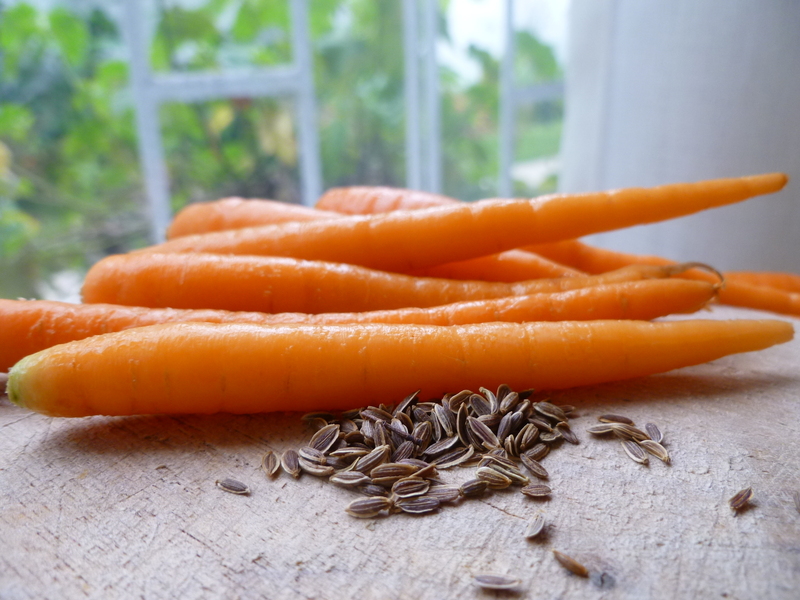 The highest concentration of their nutritional value is removed with their peel and the thin layer of carrot just below it; they are soaked in a chlorine solution to delay discoloring and spoiling–and sold at a higher markup than regular whole carrots. Real baby carrots are easy to identify. Though they come in many shapes, they have their skin on…and it is a thin, delicate skin that requires only washing. There is no need to peel these little vegetables. And supposing no real babies are available, cutting regular whole carrots into sticks will make very good Marinated Carrots with Mustard Dill Dressing. 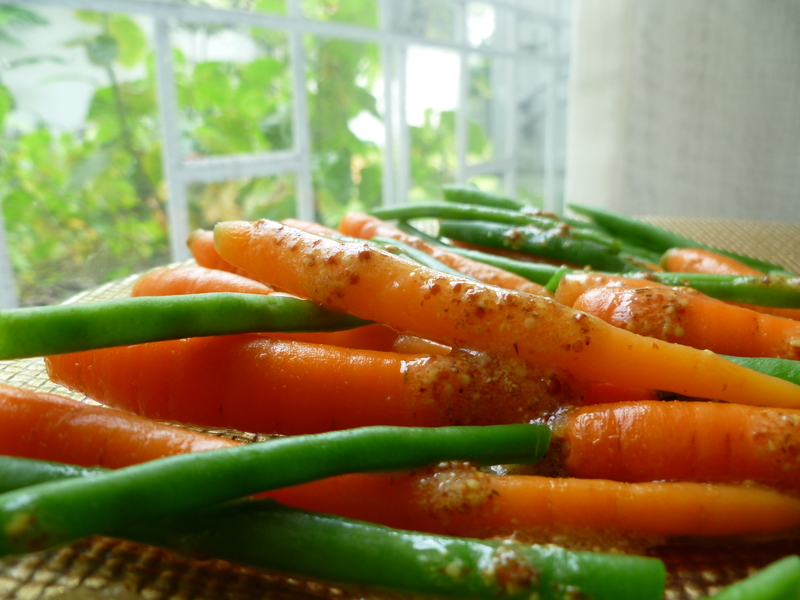 A Note: Cook and marinate the Carrots one day in advance. 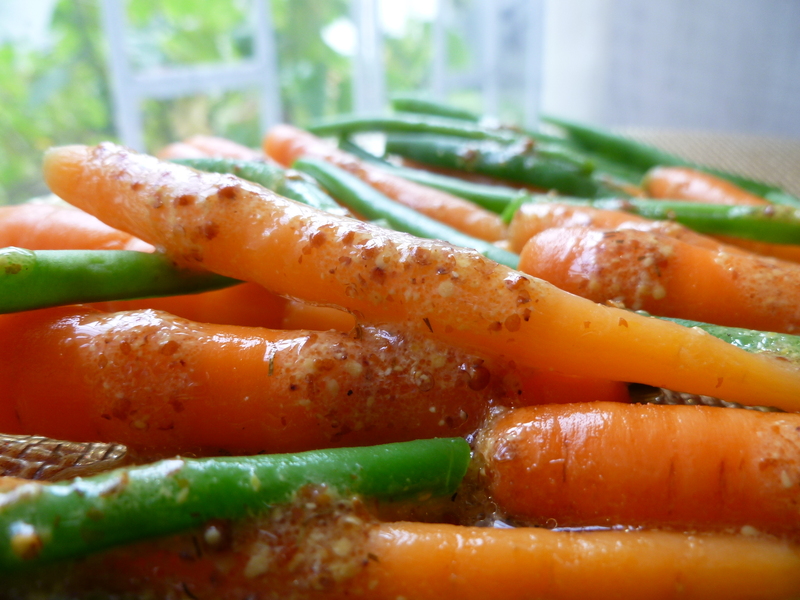 The Marinade has to have time to cool before adding the Carrots to it. Blanch the French Green Beans the day you serve them and keep them in iced water until shortly before putting them in the Mustard Dill Dressing. 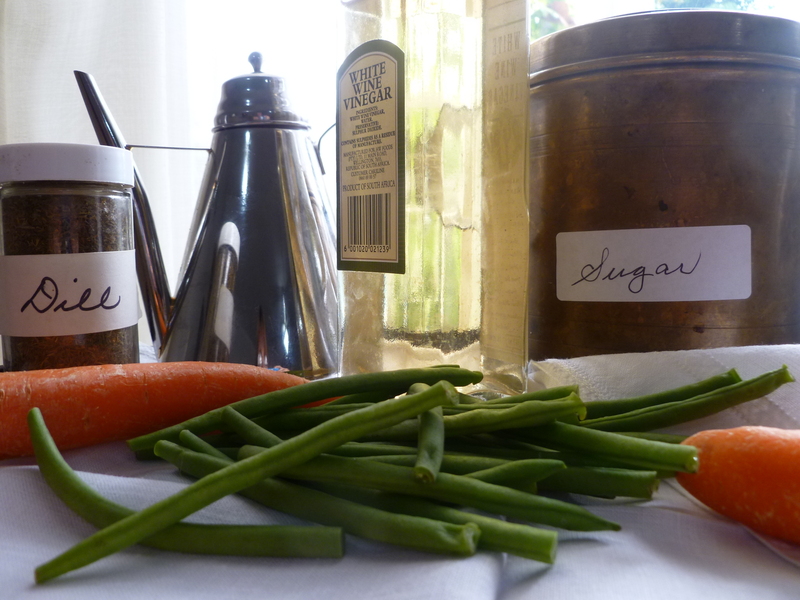 The recipe for the Mustard Dill Dressing is given below, after the instructions for cooking the vegetables and marinating the carrots. 1. Put all the ingredients for the marinade in the small pot and bring them to a boil, stirring until the sugar is dissolved. 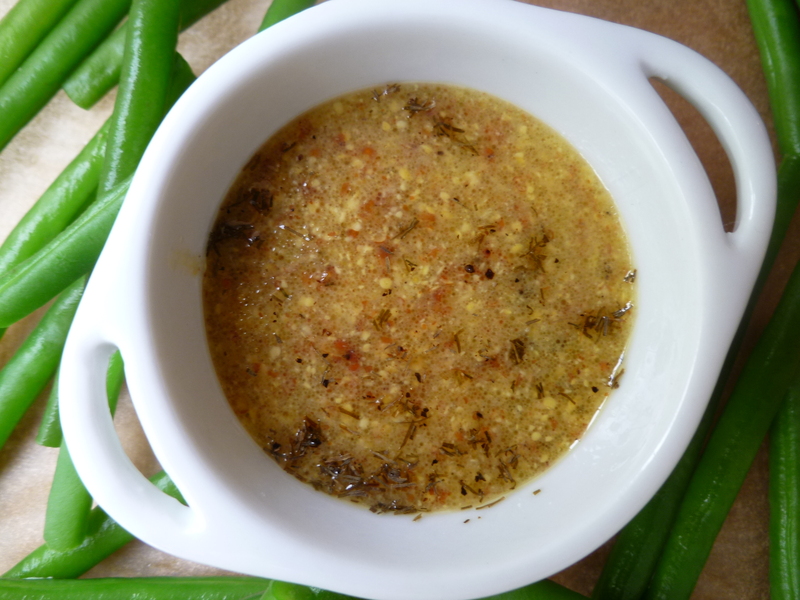 Cool the marinade. 2. Add a teaspoon of Salt and a teaspoon of Baking Soda to a pot of water and bring it to a boil. Add the whole baby carrots or carrot sticks and cook them until they are crisp-tender. The time this will take depends on the size of the carrots. The ones in the photos were ready in about 7 minutes. Adding Baking Soda to the water quickens the cooking time and tenderizes vegetables. 3. Drain the carrots and put them in a bowl of ice water to stop their cooking. 4. Drain and dry them and put them in the cooled Marinade and refrigerate them, covered, overnight. 1. Cut the tips from the beans. They are stringless. 2. Put a teaspoon of salt and a teaspoon of Baking Soda in a pot of water and bring it to a boil. Add the beans and cook them for 2 – 3 minutes, or more if you prefer soft vegetables. The ones in the pictures are cooked only a few minutes. 3. Drain the beans and put them in a bowl of ice water to stop their cooking. Keep them in ice water until it’s time to dress and serve them. 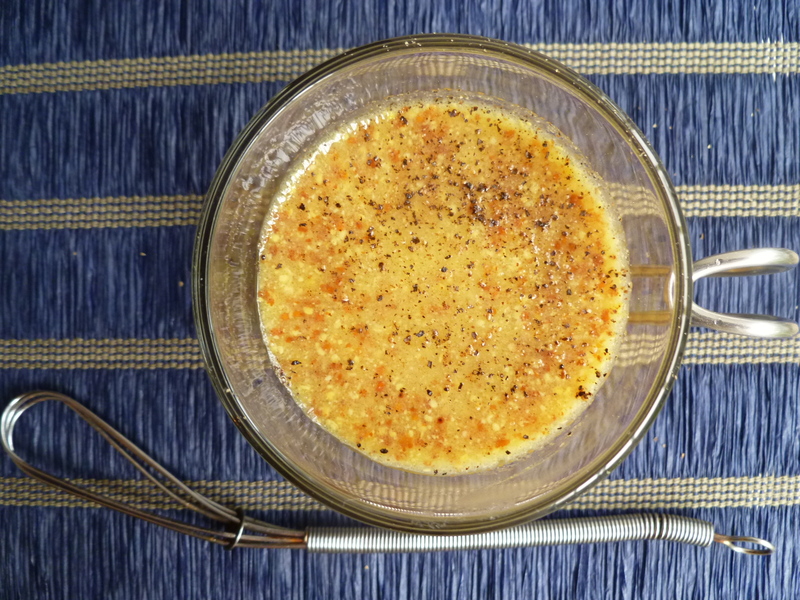 The Vinaigrette is best when the oil is whisked in right before putting it on the vegetables. 1. Put the mustard, vinegar, water, sugar and salt in the bowl and whisk them together. 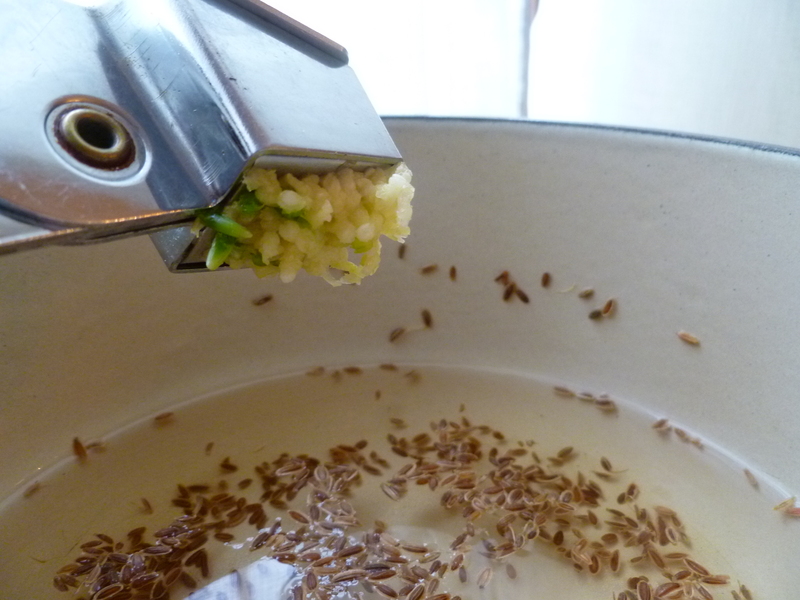 Add the oil in a stream, whisking, until the dressing comes together, then, whisk in the dill. IV. Dressing and Serving the Vegetables. 1. Drain the beans and dry them in a cotton towel. 2. Take the carrots out of the marinade and arrange them on a plate with the beans in a way that looks nice and makes it easy for people to pick a bean or carrot up by the end and put it on a small plate–or eat it straight from the platter. Spoon some vinaigrette over them. 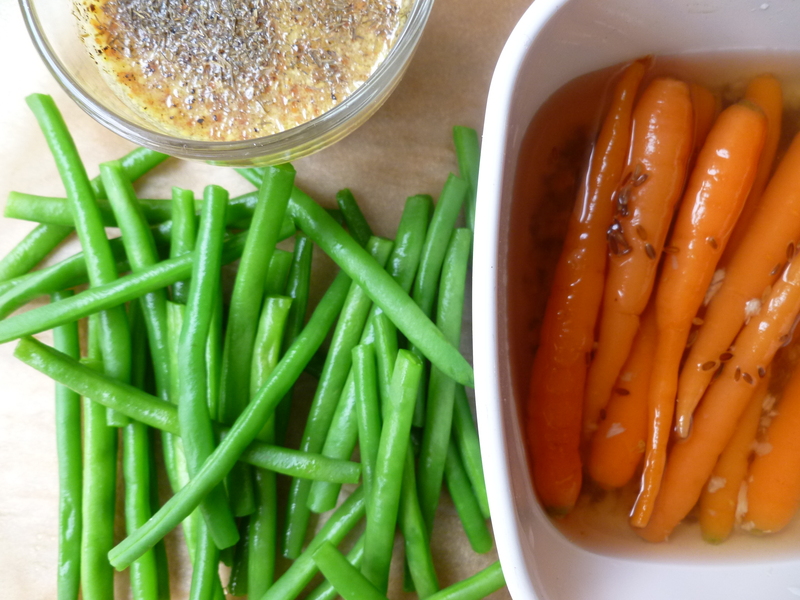 A Note: French Green Beans and Marinated Baby Carrots with Mustard Dill Dressing are served with aperitifs in the Menu: Lunch on a Winter’s Day. This recipe is adapted from one that appeared in the December 1994 issue of Gourmet magazine. A Second Note: There is a virtual exhibit on “The Origin and Evolution of Baby Carrots” here at the World Carrot Museum.